Don't forget that this Saturday the 30th of MAY we'll be kicking off our 2009 monthly market season! Free cocktails after 11 am...well as they say "as long as it's cocktail time somewhere in the world!" Lots of gorgeous hand made loveliness from the talented Craft Guerrilla guys and gals. Help support British Craft by buying direct from the designer makers! Kates' café is the latest exhibition to be shown in The Rebecca Hossack Art Gallery. The Gallery is renowned for its broad spectrum of contemporary arts and in this latest show the gallery celebrates its appreciation of the cutting edge modern art scene. Created by artist Kate Jenkins Kates' Café features a a series of beautifully knitted artworks based on a café foods. The collection, which includes meticulously re-created fish and chips, fried breakfasts on knitted plates and knitted condiments such as tomato ketchup bottles and mustard pots are all framed as original art pieces. 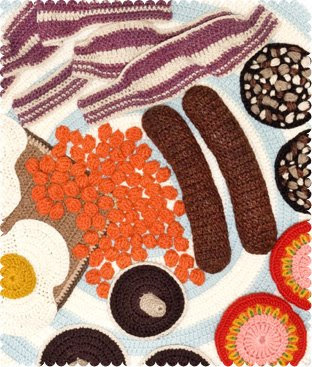 Jenkins first made her name in the art world in 2007, after creating a series of knitted artworks based on a “greasy spoon” menu. These fabulously crafted original art pieces, formed an exhibition called Comfort Food the exhibition was followed with a new body of work called Soft Smokes. Inspired by the no-smoking ban, the exhibition featured a collection of knitted cigarette packets, papers and matches with brand names including Sewn Vesta, Woolboro and Fluffy Strike. 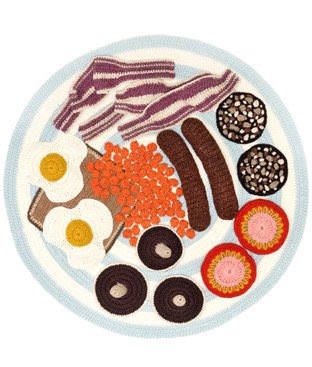 After the success of the Comfort Food exhibition Kate was approached by the Art Group publishing company to create a series of greeting cards based on the crocheted food theme and has continued to work with them on a series of other ranges. Kate's Cafe will be Jenkins first solo exhibition in London and it embraces the individuality, innovation, technical accomplishment and beauty that the Rebecca Hossack Art Gallery has become loved for. Wednesday the 27th of May. Free entry. Free cake. D.i.y. craft packs and in house tutors on hand should any budding crafter need any help! 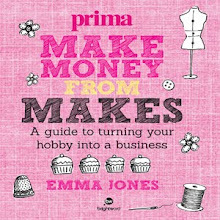 "Emma and Clare Murray are not only craft sisters but real sisters! After fighting each other with scissors and felt for years we've decided to take over Edinburgh with craft instead! Clare is better at the fiddly little things- she's very small! Emma is better at making things from mistakes- she makes a lot of mistakes! Neither profess to be experts but some of their favourites are: silver smithing, wire French knitting, knitting, sewing and making things up from ideas. Together we make Edinburgh Craft Guerrilla! Come and join us at our launch." 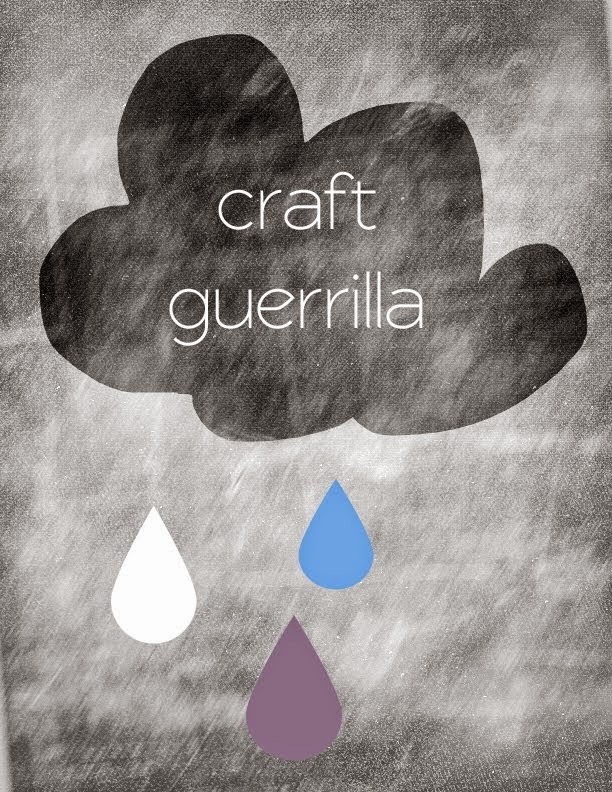 Edinburgh Craft Guerrilla blog coming soon! 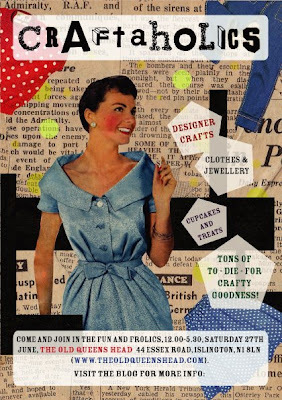 We're well pleased that our crafty friends "Craftaholics" are holding a fair in the Old Queens Head. We love the venue,that's the home of out afternoon Crafternoons each second Saturday of each month....hmmmm I have a feeling that we might just join forces one day!Now wouldn't that be crafty? "An afternoon of handmade craft and ethical products from designer clothing to jewellery to dolls and everything in between. There's homemade treats to nibble, booze to down and music to savour all under the roof of Islington's hippest venue. All this and much much more for FREE!!! 12.00-5.00, Saturday 27th June, The Old Queen's Head, 44 Essex Road, N1 8LN "
!CANCELED! Put the needle on the record !CANCELED! We're really sorry to say that our next D.I.Y. craft night in The Castle has been canceled for now and for the foreseeable future too! Anyway we're getting out and about and looking for another venue so as soon as we have something lined up we'll let you all know. Tuesday 2nd of June 8pm - 11pm Swishing with the Craft Guerrilla "fancy something new" at 93 Feet East Pink Bar. A veritable cloths swaperama. The gals will be putting up the washing lines so all you recycling lovers can get some new apparel to wear on the town! We'll be on hand to help you pimp up your new outfits! Please bring along your own projects and enjoy the creative vibe in the Pink Bar. Guest DJ's, in house tutors and a fully licensed bar. Free entry. £5 cover charge to participate in the swaperama. Minimum 1 item,maximum 5. Please insure all items are in a good,clean condition. D.i.Y. crafting Craft Guerrilla style! Join us for an afternoon delight of crafting. In house tutors, guest tutors, vintage board games, Guest DJ's, a fully licensed bar and yummy pub grub. Free entry. Small fee per craft pack. Please feel free to BYO projects. Wednesday 16th June 6.30 pm - 9.30 pm The Make Lounge, Islington. A bimonthly event just in time for summer. Lots of lovely festival,pic-nic and outdoor fun inspired projects! Pre booking essential. 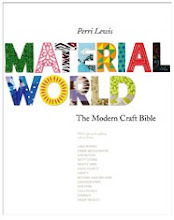 Please visit the Make Lounge web site for further details. 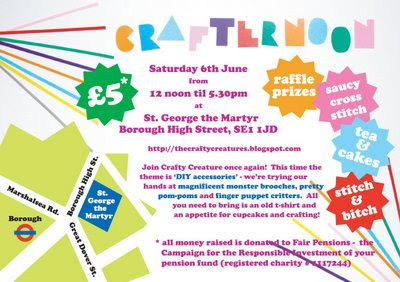 On the 6th June the Crafty Creatures return, with a second Crafternoon extravaganza at St George the Martyr, Borough High Street (opposite Borough Tube!). The first Crafternoon was held at Easter, and was such a massive success that the ladies have expanded to a bigger, better venue with more room for crafty fun. "This time the theme is ‘DIY accessories’ and we’re trying our hands at magnificent monster brooches, pretty pom-poms, and recycled plastic purses. If that doesn’t tickle your fancy, our crafty ladies will help you whip up some saucy cross-stitch or (for the younger crafter) finger puppet critters, while plying you with the finest array of hot drinks and home-made cakes. All you need to bring is an old t-shirt and an appetite for crafting and cupcakes." Fabulous raffle prizes will also be on offer and live bands will strum acoustic music for your listening pleasure. With a venue that is opposite Borough tube station and a stones throw from London Bridge, a fun afternoon of craft and cake couldn’t be more convenient. The Crafty Creatures fundraise for the charity FairPensions, who campaign for your pension to be invested responsibly and ethically. 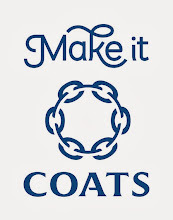 All profits will go to them – so while you’re stitching your brooch you can be happy in the knowledge you’re helping to make the world a better place. So come on down to Borough and let out your inner crafty creature! 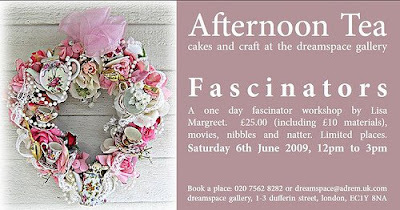 Lisa Margreet our own fab Craft Guerrilla will be teaching a fascinator workshop at the Dreamspace Gallery in Clerkenwell on Saturday 6th June. Limited places so book early! "Not only will you learn the skills to make your own fascinators, but I'll also be revealing my favourite suppliers, vintage tips for authentic styling AND you get to design, make and take home your own fascinator. All for £25? Have you heard of a better bargain? And you get cake? SIGN ME UP! Oh, wait. I'm teaching it! :)"
Lisa Margreet will be teaching a beginners crochet workshop at the Dreamspace Gallery on Saturday 20th June. "I'll teach you the basic stitches, how to make a classic granny square and you'll get all the bits you need (including the materials a demo and hands on tutor help) to make my crocheted daisy chain headband. Limited places available so book quickly!" We know just how much you folk love the Monthly Walthamstow D.I.Y. 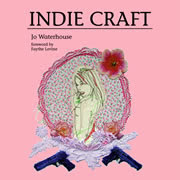 Craft Wednesdays so we're looking into finding an alternative venue for the 20th of May. As our usual home has changed hands and they're refreshing,cleaning and moving in this month... we won't be able to do our "Craft Thang" at the Castle! It's cool but a shame as all you lovely people (and us) were looking forward to creating a bit of crafty fun! Fingers crossed we'll have some info soon about the new venue so please keep checking the blog. Don't forget that we have other monthly events and a new bi monthly residency at the Make Lounge in Islington. Hooray,the competition is now closed and the winners chosen*! We've taken the winning names out of our beautifully hand knitted Craft Guerrilla beret and a few lucky folk have bagged themselves a years free listing on our web site...Congratulations!!! Sorry to those that haven't won...keep trying,you never know, one day it might just be you! *winning entries have been notified by email.Listings will be active form the beginning of June 2009. It's finally here...after months of planning our first Crafternoon is on tomorrow upstairs in the Victorian room at The Old Queen's Head Essex Rd, Islington. Handsome Twins, vintage board games, craft packs,in house tutors should you need a helping hand and an ale or two to get even the shyest of crafters into the "make it yourself" spirit. No need to be oh sew shy shy! Come join the creative vibe,bring your own craft projects and enjoy the company of fellow crafty creatures! From 2 pm to 5 pm. Free entry. All welcome. Think Craft...a date to put in your diary! Saturday May 16th between 10am and 12 noon. Guide Hall, St Thomas' Church, Prince George Ave, Oakwood (London). N14 4SN. 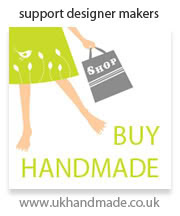 "Looking for fabulous handmade gifts, crafting supplies, ingenius ideas and some friendly faces? Then just down the road from Oakwood tube station you’ll find this hidden gem of the london craft scene. Some beautiful handmade cards you want to sell, perhaps you’ve got loads of materials you don’t use any more? Email or call us about any questions you may have or to book up a table. Whether you're a season crafter or a complete novice we're sure you'll enjoy the creative atmosphere! There's a plethora of events coming up and we're so excited to be hosting our first of many monthly events. Tuesday the 5th May PINK BAR 93 Feet East Brick Lane. A veritable evening of fun,craft and cloths swapping! Our washing line will be up and ready for all you fashionable folk to hang your unwanted apparel and once we give the go ahead you'll be able to swap for other funky wear!!! It's recycling with a twist. We'll be on hand to teach you the basics on how to hem,applique and transform your choices into a clubbing outfit! You must bring at least one piece of clothing (accessories,shoes etc. also welcome) in good,clean condition. 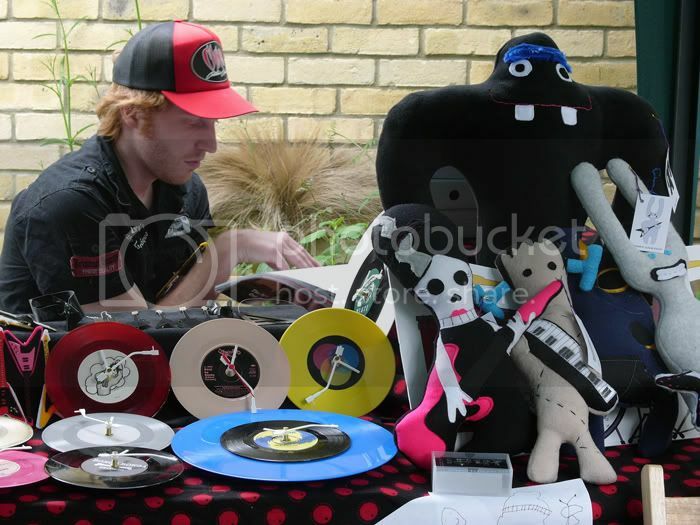 Guest DJ's and the Craft Guerrilla crew will be spinning some yarn and some tunes.From 8pm to 11pm. £5 cover charge to participate in the cloths swap. Free entry. 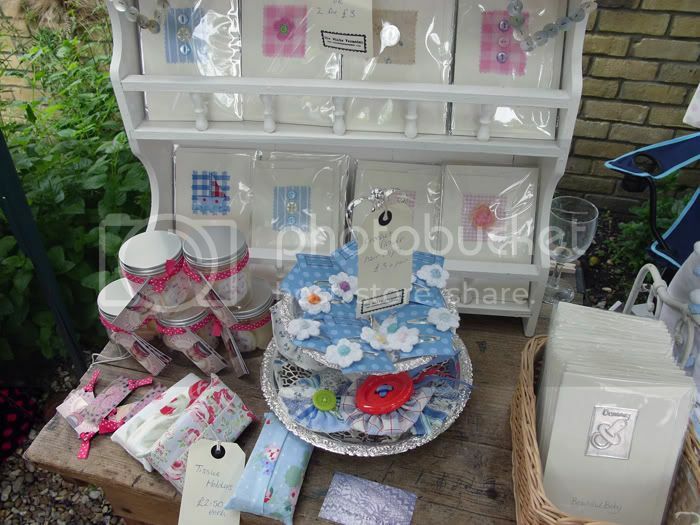 Saturday 9th of May "Crafternoons" at the Old Queens Head Essex Road. Join us for our first diurnal D.I.Y. craft event. Set in the upstairs room of the lush Old Queens Head pub in Islington the CG gals will be there with the usual crafty goodness. Craft packs, vintage board games, in house tutors and guest DJs.From 2 pm to 5pm. Free entry. Our monthly E17 d.i.y. craft night. Crafty pleasure in the suburbs! Craft packs, in house tutors, DJ's, vintage board games and an ale or two to get you stitching. It's a stitch and pissed kind of thing! From 8 pm to 11pm. VENUE TO BE CONFIRMED!!!! Please check back closer to the date! Summer's here and we're itching to get out in the shop garden! A selection of hand picked designer makers will be bringing quality art and craft to the good people of Walthamstow. Products range from : jewellery, perfumes and cosmetics, clothing, accessories, toys, illustrations, home wares, soft furnishings,art work and more! Come check out the handy work of the Craft Guerrilla guys and girls. Also there's a cocktail or two and some lovely home baked cakes for all you sweet folk! 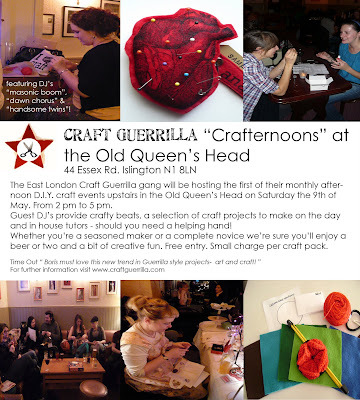 The Craft Guerrilla will be back at the Make Lounge in Islington for a summer craft night. More details including how to book tickets to follow. Please check the Make Lounge web site. Hope to see you at some point. Have a happy spring!